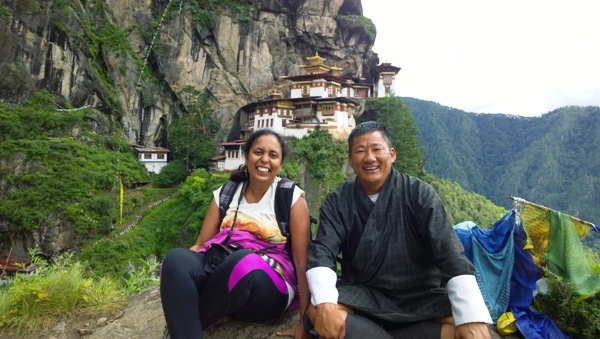 Even before landing I was excited about the trek to the Tiger’s Nest in Paro, Bhutan. As I was visiting in monsoon I asked my friends on Facebook beforehand if I should be carrying trekking shoes or normal sneakers would do? An overwhelming majority who had done the trek told me to carry my trekking shoes and I was glad that I did. The route is quite clearly marked but it rained while we were getting down, which made the trail slippery in turn. I was glad I listened to others and carried my trekking shoes. 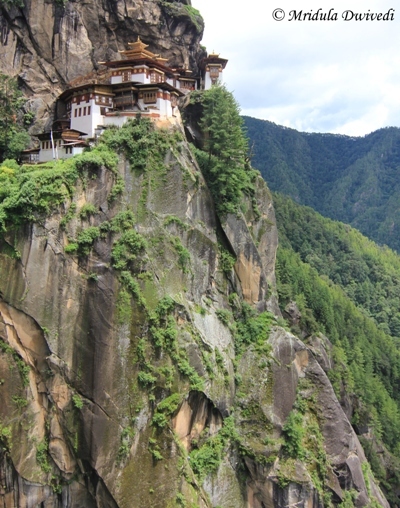 The Tiger’s Nest is also known as the Taktsang Monastery. 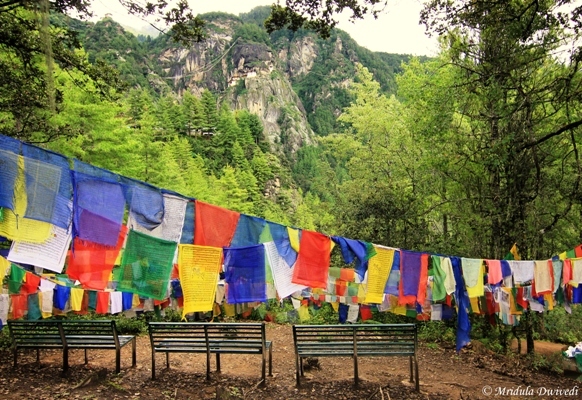 It is at an elevation of 3210 meters (10,240 feet) which is about 900 meters above the Paro Valley. I consider 900 meters a lot to be climbed in one day. We could see the monastery faintly from our hotel Naksel Resorts itself. 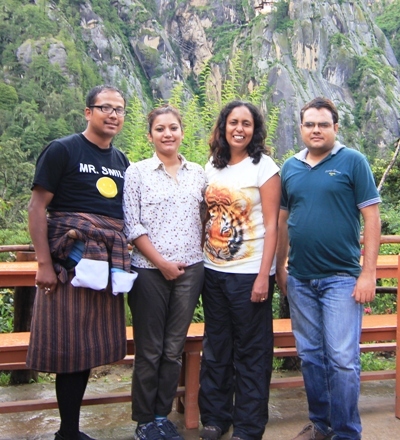 Aditya who is the business development manager of Makemytrip (my sponsors for this trip) for Bhutan had done it already. He was not sure how many of us would be able to do it. When we started we were 6 people plus our guide Raju Rai ji. The trail is well marked, there is no chance of getting lost on it. And coming from me, who can get lost even in a telephone booth if it had two exits, it means a lot. It is well maintained and litter free as well. We started slowly from the base. After a while I found my rhythm, and started going up. Soon one of us wanted to go back and Raju ji went back with them as well. He said he would catch up with me later. I meet three of my mates on this trip a little ahead. I had a sip of water and told them that I would go ahead. We decided to meet at the cafeteria. Aditya told me that the cafeteria was at least 40 minutes away. 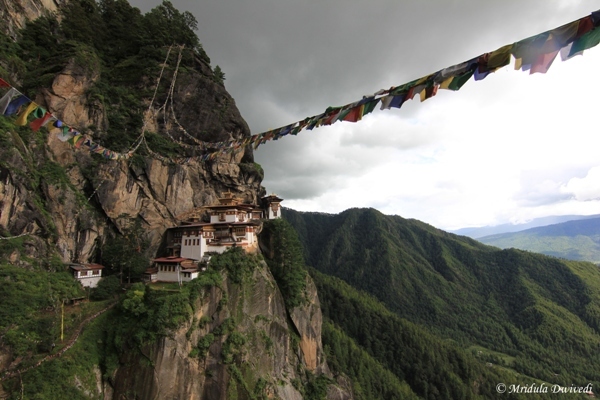 According to the legend it is said that Guru Rinpoche flew to this treacherous location from Tibet on the back of a tigress from Khenpajong, hence the name Tiger’s Nest as well. From below, the location of the Tiger’s Nest looked so fantastic! To imagine that people were reaching here in 8th century was mind boggling. The mind would also boggle a bit at the thought that I had to climb all this to reach the place. In my mind, there was no doubt that I would reach there eventually. It took me less than 40 minutes to reach the cafeteria. I sat down and asked for a cup of tea which never arrived. I am told that the hike is 3.5 kilometers one way. The cafeteria is the only source of nourishment on the way, though there is water available in many other places. After waiting for half an hour I was getting really impatient. Then a man with his cell phone came and said I should talk to my guide. I was happy to hear Raju ji telling me to proceed as others had gone ahead! I was quite happy to start again. On the way I was asked by a few guides if I was trekking alone? I told them I was with a group and walking alone only for a while. Later on the trail they also told me that the Tiger’s Nest Monastery closes from 1.00 pm to 2.00 pm so that the lamas could have lunch. I realized that I would miss the 1.00 pm cutoff time. They told me to go slowly and click a lot of pictures! I readily followed the advice. At this point while I was getting my photo clicked, Raju ji also came and we then walked together. I met an Indian family as well around this place who were heading back. I guess they were quite tired and irritated. But to their credit they had young girls with them, one of them fast asleep and the other I was told trekked all the way to the Tiger’s Nest. Slowly I too reached the premises which was closed now. I was happy to sit and wait for the gates to open. They kept my bag and camera safely. We are not allowed to carry even the cell phone inside. 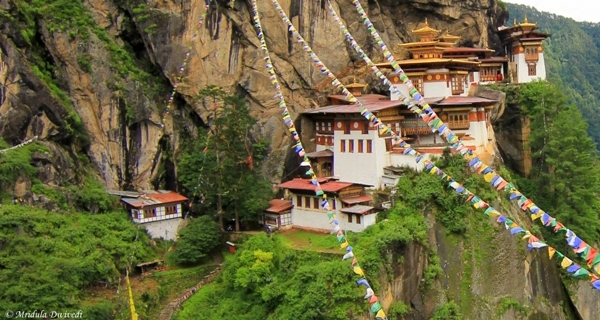 It is difficult to imagine that the Taktsang Monastery was burned down due to fire in 1998 and rebuilt in 2005.It looked as ancient as ever. Within no time ( at least it felt like that to my tired limbs) the gates were open again. Post 2.00 pm the place is much less crowded. Raju ji taught me how to bow in Buddhist style. After a brief stay inside the monastery we headed back. It was threatening to rain now. We still decided to stop at the place where prayer lamps were lit and have tea. When it was our turn to pay, the monk told us that it was free of cost. He then told Raju ji something in the local language. Raju ji told me that the monk had been to Punjab (India) where he had free food in a Gurudwara, so the tea was free as well. There are a lot of stairs as we start going back. I was dreading that I would get way too tired climbing them. But it started to rain and I had to put my camera in and get the raincoat out! In all this confusing and the pouring rain, I didn’t even realize how I managed to climb up all those stairs. Once I was through with the stairs, it was majorly downhill from there. The trouble with me is that I find it equally tedious to go downhill. We stopped at the cafeteria to have a late lunch. Then we started climbing down slowly marveling all the way that how much did we really climb! In the picture above you can see Raju ji in his traditional dress called Gho. I was wearing a tiger t-shirt but this one didn’t know how to fly! 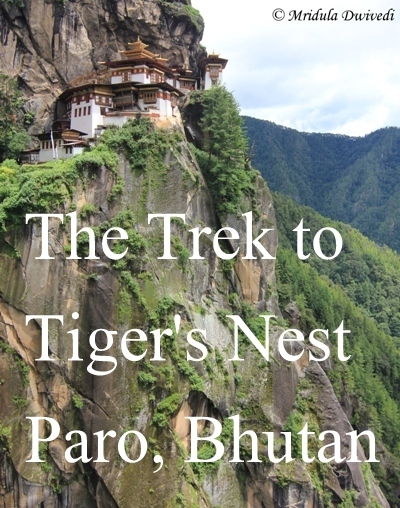 If you are into hiking, the climb to the Tiger’s Nest is quite manageable. However, I remember an elderly gentleman whom I met while climbing up to the Tiger’s Nest. He was still going up when even I was headed back. He must have been caught in that rain going to the monastery. At one point, much lower in the trail, I told him, “you would remember this fondly 5-6 days later, take my words for it.” He had capable guides and a companion with him. I hope he made it and is now remembering his hike with a lot of happiness. He told me to eat less rice if I was not losing weight in spite of hiking. When we reached Naksel Resorts late in the evening they offered the three of us an one hour’s massage in their spa. Needless to say it was the best massage I ever had till date.